numero UNO: our friends and neighbours Francesca and Paolo finally received the itinerary for their trip to China to become parents, on the 22nd of February they will at last be able to hold their 1 yr old daughter Lè Chen in their arms.!!! Just wait until they tell her about all the crazy people anxiously awaiting her back here at Incocco, she may decide to remain in Guixi !!!! And in the new arrival theme, YES the first chicks have hatched!!!! Spring must be on its way. At this moment (6pm) we are up to 15 and still lots more pipped and peeping!! Little LeChen is going to love them! Ok and about yesterday, the first group hike in the almost spring weather, water everywhere on the trails. 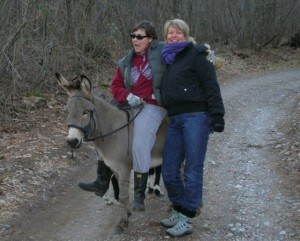 It was a great group hike with the usual people (8) and dogs (4) but for fun Frà decided to add in Sophia the donkey and Sole the goat. Just so you see what silliness we can get up to on Sundays! Mi sembrano 3 magnifiche asienelle! Ci vediamo al tuo ritorno. Mega Party a Incocco per dare il benvenuto alla tua piccola!!! Very fantastic place! All beautiful. Grazie molte per la splendida giornata ed accoglienza.